If you suffer from dry skin, it can be hard to find a non-abrasive soap which will rehydrate your pores, yet not irritate or over-dry your skin. While there are many great body washes for dry skin and face washes for dry skin products on the market, sometimes you just can’t beat a good soap to cleanse and rejuvenate your pores. 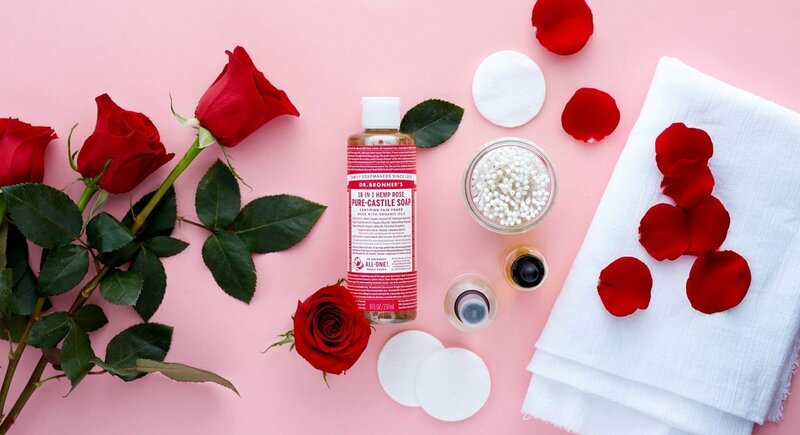 When it comes to dry skin, it’s important to find the soap that is gentle enough to be used daily, yet powerful enough to scrub away dirt, germs, and makeup. If you’re looking for a good soap for hand washing, you will want one that doesn’t dry out your skin even more, especially during the harsh winter months. The following are reviews of some of the best soaps for dry skin which can help you choose the right product for your skin and hygiene needs. 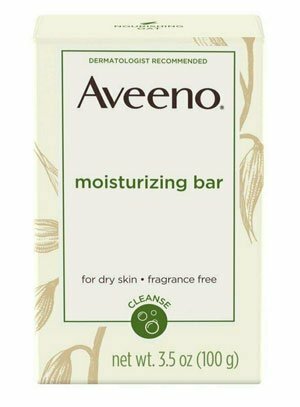 Aveeno’s Naturals Moisturizing Bar soap uses oat to nourish and cleanse your skin and pores gently. The oat helps lock in moisture for dry skin, and the oat is neutral enough not to aggravate or inflame dry, itchy areas of skin. 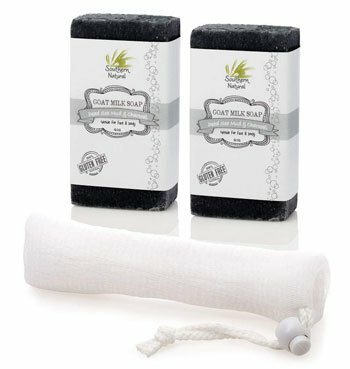 While this bar soap is marketed for facial cleansing, it also works well as a body or hand soap. It is fragrance, dye, and soap-free, which also makes it friendly for those with sensitive skin. Many users report that this is a daily soap they have used and depended on for years, and it has always kept their skin clear and nourished. 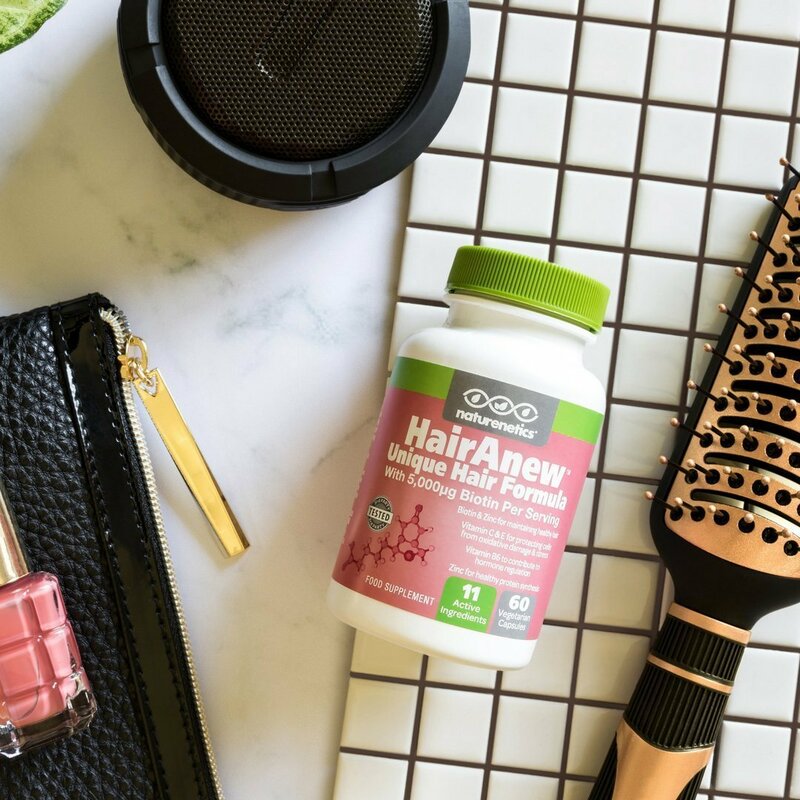 It works especially well when paired with Aveeno’s Daily Moisturizing Body Lotion for hydration that lasts all day. 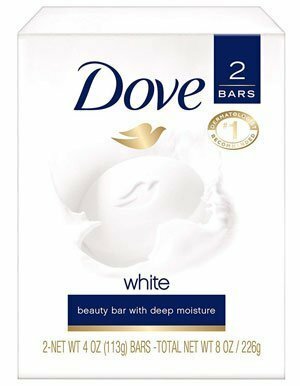 Simple, dependable, and extremely effective at moisturizing dry skin, Dove’s Beauty Bar has been a standard skin care product on the market for many years. Its popularity arises from its special blend of moisturizing cream and cleansers, which makes it more of a luxurious spa soap than an ordinary soap bar. It is the #1 recommended beauty bar for dry skin by dermatologists, known for its lasting protection of the skin’s natural moisture barrier and residue-free finish. Users who suffer from skin allergies or sensitive skin find this soap to be mild enough to not aggravate their allergies, and in some cases, it even helps to clear their allergies and skin irritations. If you want to have baby-soft skin, sometimes it’s easiest to turn to a product that is developed specifically for babies. 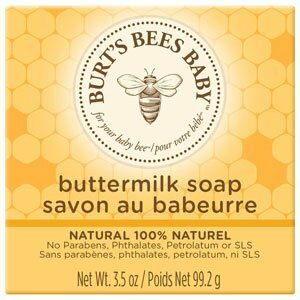 Burt’s Bees Baby Buttermilk Soap uses luxurious buttermilk moisture to lather and lock in the skin’s natural moisture barrier. It cleans without stripping away the skin’s hydration, and since it’s developed for babies, it’s extremely gentle. This soap is all-natural, pediatrician-tested, and hypo-allergenic. Many adult users prefer this soap for their face, especially since facial skin can be extremely sensitive. With all-natural ingredients, it is also a great option for people with skin allergies and sensitivities to harsh chemicals. Much like the Dove Beauty Bar, this simple bar soap by Nivea is understated in its packaging, but it produces amazing results. This soap is incredibly nourishing with a moisturizing cream blend to protect the skin’s natural moisture barrier while cleansing the pores of dirt and dead skin cells. The result is a brightened complexion with a light, soft scent on your skin. This bar soap also works well for simple hand washing, especially during the winter months. When the air is dry and the wind is cold, cracking skin on your hands can be painful and itchy. 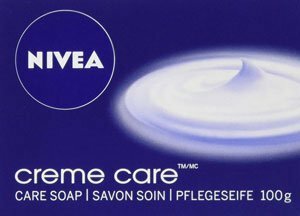 Nivea Creme Care Soft Bar Soap helps keep the skin of your hands soft and hydrated. This vegetable-based soap is made with community trade Shea and sustainable palm oil for a truly luxurious lather. 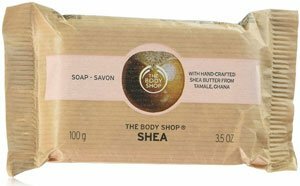 The Body Shop Shea Soap incorporates Vitamins A and E into its blend to help moisturize and protect the skin’s natural moisture barrier. 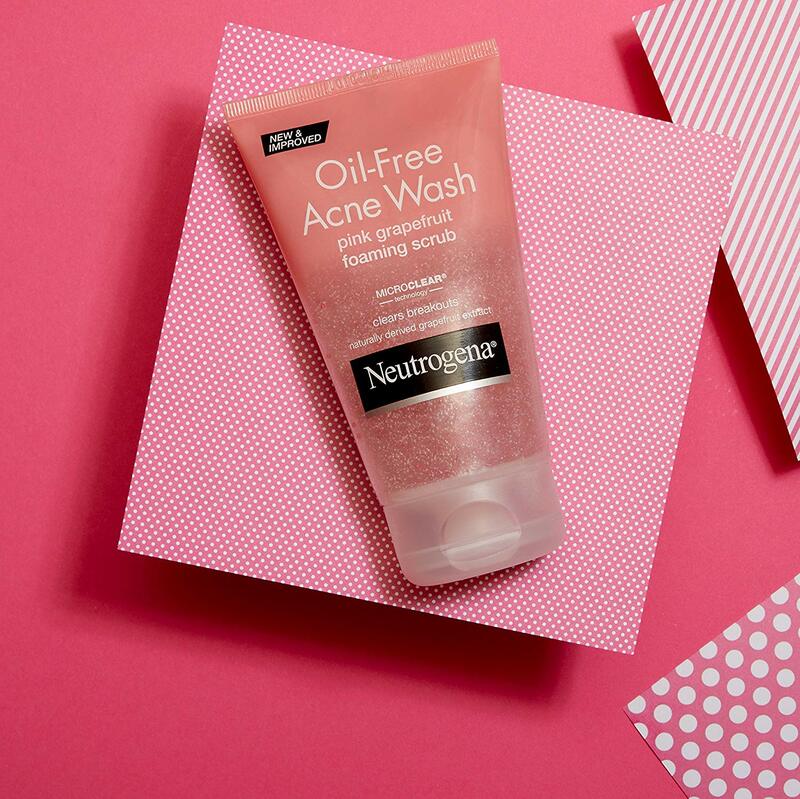 The palm oil cleanses the pores gently, without leaving behind a harsh residue. Dry skin sufferers love this blend, and some of The Body Shop’s other soap scents including their Coconut and Pink Grapefruit soaps. This soap is gentle enough to be used on the face, body, and hands as a daily cleanser, and will leave your skin feeling soft and smooth for the whole day. Cetaphil products are designed for dermatologists to recommend to their patients with extremely dry, sensitive skin. They again deliver with their Deep Cleansing Face & Body Bar, which removes dirt, makeup, and oils without over-drying the skin. It’s gentle enough to use daily, yet strong enough to cleanse deep down into your pores. It is non-comedogenic so it doesn’t leave a residue behind which will block your pores. Users report that this simple bar of soap has helped to rehydrate their dry skin and clear stubborn acne. Users of this soap also are happy because with this bar soap, a little bit goes a long way and the bar lasts a long time. Many like to combine this soap with Cetaphil’s Moisturizing Lotion for All Skin Types, which locks in moisture for up to 24 hours. Dry skin can occur from a variety of issues, some of which include psoriasis, eczema, rosacea, and harsh sun or cold wind. 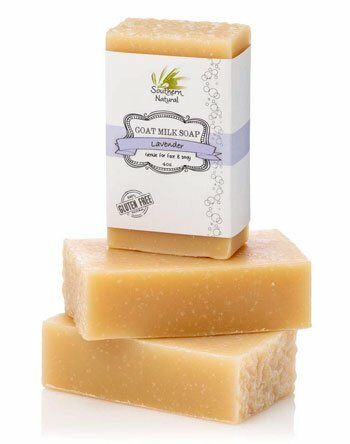 This all-natural Goat Milk Soap Bar by Southern Natural uses goat’s milk, lavender essential oils, and lavender, palm, and coconut oils to create a luxurious, gentle moisturizer which tackles tough patches of dry skin. This is one of the best soap for dry skin. This soap is so versatile and gentle on the skin that it can be used for babies, shaving, and as a facial cleanser. Consumers rave about its effectiveness at clearing up and rehydrating areas of eczema and psoriasis. For some users, it is the only soap they trust for their child’s delicate skin. Because this bar soap doesn’t contain harmful chemicals, it doesn’t dry out the skin by breaking down the skin’s natural moisture barrier. 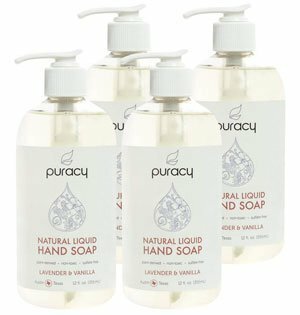 Puracy’s Natural Liquid Hand Soap is a sulfate-free hand soap which lathers up into a moisturizing wash which doesn’t dry out the skin. Their formula includes Vitamin E, sea salt, and Aloe Vera to hydrate the skin gently, and soothe irritation. Vanilla and lavender essential oils help to lock in moisture and create an invigorating, relaxing scent. Environmentally-conscious consumers will happily note that this product is vegan friendly and cruelty-free. It is also hypoallergenic and biodegradable. It is an excellent choice when you’re searching for a good hand soap that won’t dry out your skin, especially if you are washing your hands several times a day. A little bit goes a long way, too, so just one bottle will last you for awhile. This is one of the most popular pump soaps on the market, being used in many public restrooms and offices as the “soap of choice” for customers and employees alike. 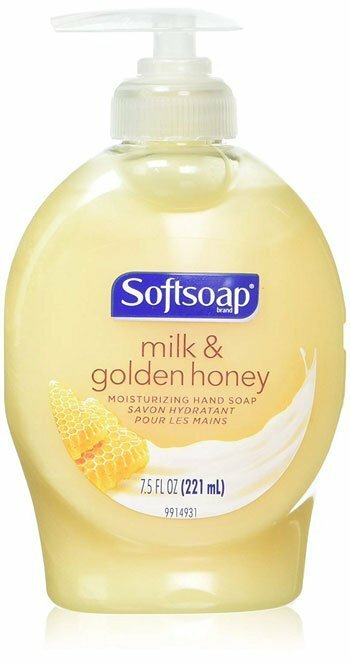 Softsoap Naturals Moisturizing Liquid Hand Soap with Milk and Honey doesn’t pump out like a typical hand soap; instantly, you will notice a difference in the rich texture of this liquid soap. As you wash, you will enjoy the scent of milk and honey which simultaneously lock in moisture and clean germs and dirt from your pores. There is no residue after washing, and your hands will feel ridiculously soft and smooth. Many users love this so much as a hand soap that they also use it as a face wash to help soothe their dry skin. As one user states, this soap feels like a “high-end product at an affordable price.” The smell of this soap is definitely high-end, with the Aloe Vera and green tea extract melding into a rich, full-bodied sensory experience. This foaming hand soap is excellent for moisturizing dry, dull skin and cooling irritated or inflamed patches of dry skin. The Aloe Vera and green tea extract gently cleanse the pores and seal in moisture. 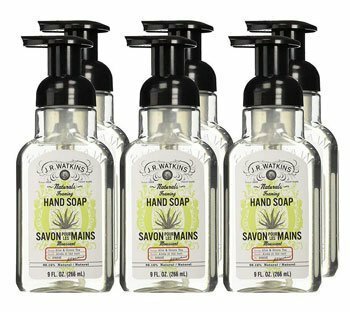 It is paraben-free, plant-based, and cruelty free, and it is a great choice for those looking for a daily moisturizing hand soap to tackle stubborn dry skin. Southern Naturals is a leader in the body product industry with consistently superior, all-natural products. This particular charcoal and Dead Sea mud formula targets skin issues that often create dry skin, including eczema, psoriasis, and acne. This is one of the best soap for dry skin. The charcoal lifts impurities out of the pores gently, while the minerals in the Dead Sea mud improves skin’s overall health and appearance. Their special formula also uses olive oil, coconut oil, and palm oil to hydrate and moisturize. Meanwhile, their essential oils, including peppermint, rosemary, and eucalyptus have antiseptic and antibacterial properties to keep the skin’s pH levels balanced. The smell is also energizing and relaxing. 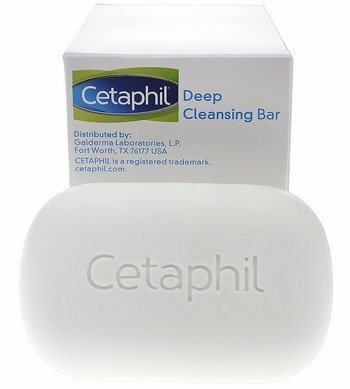 Many users rave about how this bar soap clears up their acne, psoriasis, and eczema, and helps prevent future outbreaks. The bar lasts a long time, too, so it’s a worthwhile investment in your skincare needs. This foaming hand soap by MADE OF is developed specifically for babies and children, but adults find many benefits in its daily use as well. It is certified organic, vegan-friendly, and gluten-free. For sufferers of eczema and other areas of dry, cracked skin, this soap really settles into the skin deeply to repair and restore the skin’s natural moisture barrier. It’s incredibly gentle, and can be used in place of regular hand soap for multiple washes a day. It is also paraben-free, sulfate-free, and hypoallergenic. This soap has been dermatologist and pediatrician tested to ensure that even the most sensitive skin, or allergy sufferers, won’t break out from this soap. Many users choose to also purchase MADE OF’s Baby Dish Soap and Organic Baby Wash and Shampoo, all made especially for people with dry, sensitive skin. If you suffer from dry skin, you know how difficult it can be to find the right soap that won’t over-dry your skin or leave an oily residue which can clog your pores. Since many dry skin sufferers also deal with issues such as psoriasis and eczema, it can be tricky to pinpoint a great soap formula that won’t cause those issues to worsen. Sun, wind, cold, and daily activities can really deliver a punch to our body’s largest organ, which is also the organ we display to the world each day. When you have dry skin, it’s important to make sure that you choose products that will repair the damage caused by daily activities and the weather, but will also help prevent dry, itchy skin from returning later on. The American Academy of Dermatology has several tips for helping prevent dry skin from returning, which can help when used in conjunction with a skin care regime that targets and repairs dry skin. Consider choosing a really good moisturizer to lock in your soap or body wash’s hydrating effects in the shower. Make sure you’re drinking enough liquids, too: dry skin can often be a result of dehydration. Don’t be afraid to look at what is out on the market for children and babies, either. Their skin is a lot thinner than an adult’s skin, so the products for their skin are extremely gentle and usually hypoallergenic. These products aim to help keep a baby’s skin smooth and hydrated, without irritating ingredients. Sometimes these products are some of the best products on the market if you are an adult who suffers from dry skin, itchy patches, skin issues, or allergic reactions to many products on the market. Our skin changes as we age, but it doesn’t mean we can’t use some of the most gentle products to keep our skin feeling smooth and soft. Finally, seek out the help of a dermatologist if you can’t find the right kind of soap or body wash for your dry skin. Your dermatologist will be able to help you discover what is causing your dry skin in the first place, and together you can find a solution that will prevent dry skin from coming back again. It’s your skin: you should be comfortable in it.